Welcome one and indeed all to the new Model Robot website and, hopefully, blog. 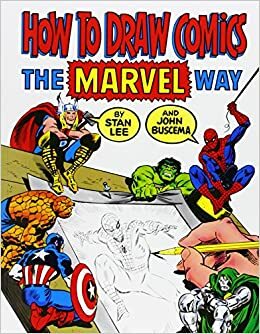 I remember back in the day, when I was kid, getting hold of a copy of ‘How To Draw comics The Marvel Way’ by Stan Lee and John Buscema. The iconic cover still brings that warm glow of memories at the hours spent drawing ‘egg’s’, tubes and square’s, trying to get perspective, proportion and costume details ‘correct’ on these damned Superheroes…think my effort’s are still skewed somewhat . Look at ******* that! That's more like it...a bit of colour! Life is art's rival and vice versa. Differing cultures throughout time may well process and evaluate this innate ability in different ways, but the base line remains, everyone can draw. We all share an initial period of drawing….exploration, mark making, colour, scribbling and creating stuff before entering the process of evaluation, categorising and rewarding begins…if you’re ‘lucky’ you may well end up in an institution where you can be ‘taught to unlearn’ this processing. Which beg’s the question can drawing be taught or simply enabled? Model Robot design and develop animation for our own amusement and that of others...sometimes...maybe...this design incorporates illustration, photography and film, as well as traditional 2D and 3D animation techniques.